Wendy Davis is your custom framing specialist. She has created frames for art and memorabilia for more than 20 years. She currently operates her own custom framing business out of Wexford, Pennsylvania. Wendy specializes in adding color and style to different areas of client’s businesses and homes. Unlike many similar businesses that just match art or memorabilia to a frame, Wendy takes the time to talk with you and understand your vision. She often enhances her client’s goals by visiting their home (in person or by Skype) to see the room and walls where art will hang. She also asks the right questions to understand what you want now and in the future. This attention to detail enables Wendy to provide a level of personalized service that few framing companies offer. Before starting her business, Wendy worked as the manager of a framing store and as frame builder. During this time, she developed expert skill in cutting frames/mats and mounting various types of artwork and memorabilia. Her unique skills include the Japanese hinge, an acid free archival mounting technique, and cross stitch mounting, a needlepoint mounting technique. Wendy developed the ability to frame or box and mat almost any type of item. She also learned how to select the best options for glass for each item. This background has given Wendy a level of expertise few in her industry can match and why she’s the online custom frame specialist for you. Wendy Davis has worked with and satisfied a wide range of business clients, including a large corporation, hospitals, colleges, and hotels. She has often saved money for her clients by finding creative ways to put existing art in a new frame. Her assignments have included framing of art, certificates, and awards. Wendy knows how to adapt to meet the needs of large and small businesses, helping them present their best image through the right kind of frame. 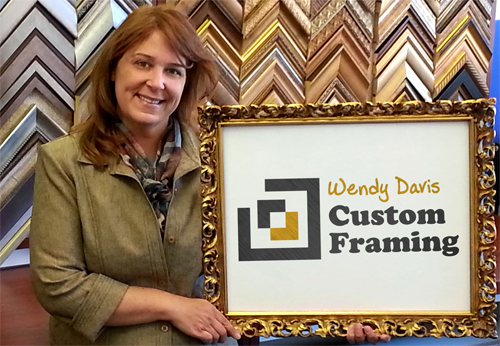 With out a doubt, Wendy is a talented online custom frame specialist for any business. You can reach her via Skype and she will happily answer your picture framing issues. Wendy has helped clients preserve treasured memories and artifacts. Over the course of her career, she has framed over 3,000 jerseys as well as pins, badges, military insignia, and photos. She will work with you to find the best type of frame and recommend ways to lay out materials. Many of Wendy’s clients use this service to create one-of-a-kind anniversary and birthday gifts. If there is a memory you want to preserve, she can help you make it lasting and beautiful. A frame is a vital part of art and its value. A damaged or worn frame detracts from what is inside. Wendy can bring a work of art or a precious memory back to life by creating a new frame that increases its value and enhances its appearance.